I think lightweight linen time is officially over for me… I woke up yesterday to a 4 degree morning (that’s 39F to my American neighbors) which required many layers and a few curse words to leave the house. 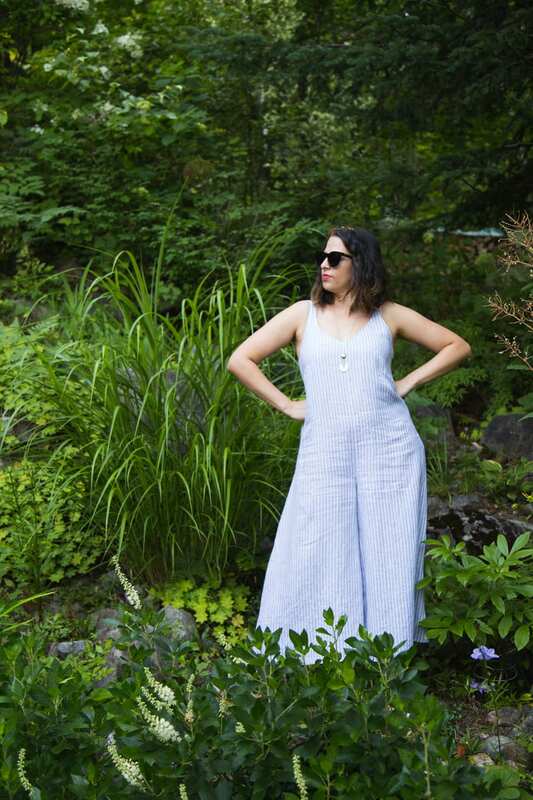 So, looking at pictures of this Amy Jumpsuit in the perfect summer-weight linen makes me already nostalgic for a season that is only barely just over. Maybe it’s because of how frequently I wore this number, how attached we became. It’s like saying goodbye to that person you became best friends with almost as soon as you met. 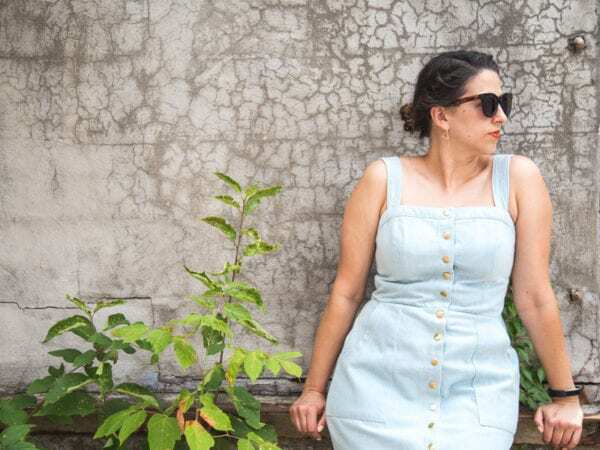 I made this jumpsuit midway through our pattern development process. Once a design has been graded I try to make at least one sample in my size; I then wear said sample as often as possible without grossing the people in my life out. I’m testing for fit, comfort, durability, whether our construction techniques will hold up to frequent use and washing. This stage reminds me of my old interior design career; we used to always have samples of furniture and millwork made, which we would then try to beat the crap out of. Sewing pattern prototypes is the equivalent of jumping on those benches to make sure they didn’t fall apart. I chose linen for this make because I wanted to see how the silhouette would stand up to a more structured fabric. 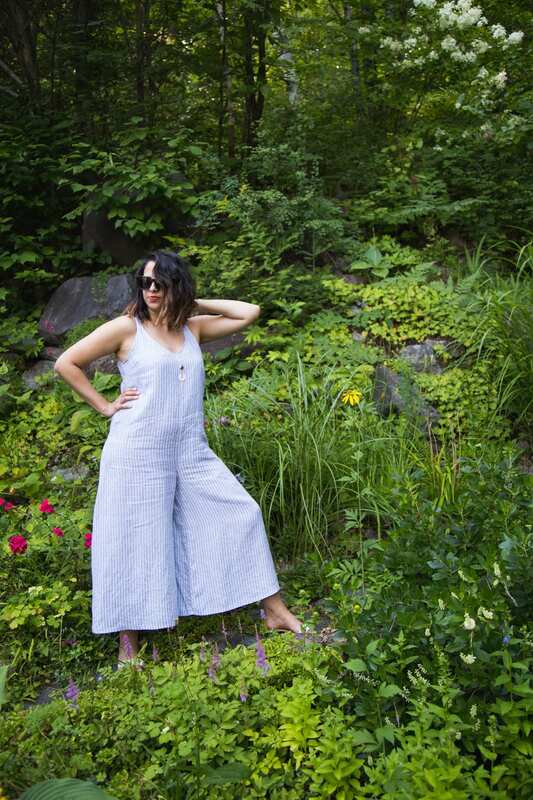 I knew I loved Amy in a drapey rayon, but what does a loose fitting, wide-legged jumpsuit look when it’s made with something a little more crisp and defined? Turns out, something good. The shape is more pronounced, the leg more defined, but the ease and comfort remain. My dream is basically to have linen against as much of my body as possible in warmer months, so this make hit all my clothing chakras. This very pretty linen is from Blackbird Fabrics (sorry, it’s sold out!) and I bought it hoping to see how Amy handled stripes. To make it work, I rotated the grainline slightly so it ran parallel to the center front and center back bodice line; this ensured I wasn’t creating any weird chevron shapes along the front seams. Shifting the grainline did affect the leg shape a bit; I found they became a bit more triangular, although that could just be the absence of any substantial drape in the fabric. Regardless, I am into the silhouette, and it looks dope af layered under a jean jacket. I skipped the pockets and topstitched the lining in place since I found it peeking out more than it had it with my other version. This prototype also helped us realize the dart was a bit too low, so we raised it for the final version. As much as I love my linen Amy, it’s getting packed away for the season. I’m excited to layer my rayon challis versions for a while longer yet, but something about rumply linen just says summer to me… I seem to start wearing it as soon as I put away my knitting, and stop wearing it the minute it’s chilly enough at night to pull out my knitting from the spring before. Are you the same way? 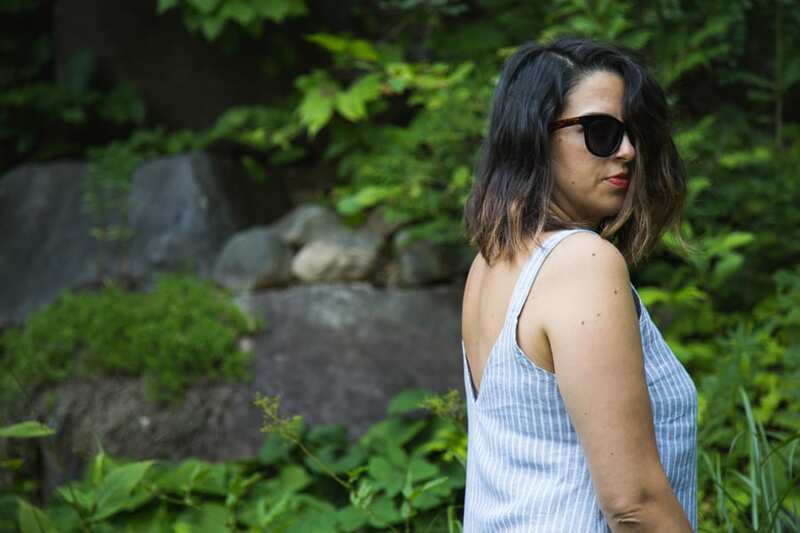 Is linen “summer only” for you too?